Update, 5/22/13: This car has since had a full body restoration, repaint and front suspension rebuild. As much as I was reluctant to redo the car, the rust was slowly getting worse, and how can I refuse a suggestion like that when it comes from my wife! And she was right, the new paint really brings out the details of the shape, and makes the car look like something special. The lowered front suspension and refinished wheels also help. It still needs a lot done to come back from years of California sun exposure, and service to the a/c system, but at this point I’m quite happy with it. Since I bought my spider in 1991, and then a new VW Golf GL in 1997 to supplement it, I had pretty much been content with saving my money and driving my two cars. As with most car nuts, I did still scan craigslist and eBay on a regular basis, and one day on the late summer of 2005, this car popped up. It was listed with no asking price, so I read the ad and forgot about the car. However, it returned to craigslist, several times. Eventually, in September 2005, after returning from a trip to Germany and just before the next trip there for my grandmother’s funeral, the seller posted a new listing saying something like “buy it or it goes to the junk yard”. Smelling a good deal, I called him up and asked a few questions about the car. It sounded pretty decent, so I went up to Pacheco (near Concord) and took it for a short drive around his lot. The interior was reasonably clean, it had recent valve rear brake and rear bearing work, and it ran & drove. There was definitely rust, but not in the places that kill these cars, and the little spoilers in front were even intact. Halfway there, so I asked him about the price… well, he’d originally been asking $1200, had one guy come by before me who offered him $350, but said he’d take $300. I asked if $250 was possible, he agreed, and we had a deal! I went back home, met my sister with her jeep, and we drove up to pick up my new car! Before its drive home – the picture with the paint wet flatters it, as it’s actually faded & rusty. Registration, the old battery from my spider, a new cat, new fuel filler hose, and a smog test were all it needed for me to get it driveable and legal. New fan switch knob. Motor and heater both worked when I put this in! Rebuilt driveshaft with new giubos. Used SPICA from Alfa Parts Exchange. This failed in an oily mess back in 2007. Rebuilt rear suspension with GTV6 springs and new transaxle mounts. Replaced all flexible brake & clutch lines. New waterpump and coolant lines, except the lower one which is NLA. New exhaust header. I stupidly cracked the old one while using it as a lever to shift the engine while installing the driveshaft. Stainless European-market bumpers. This really lightens up the car, both aesthetically and on the scale. Bent back the fender liners and scooped out a cup of dust, dirt, etc. from behind each front wheel. Now you can see roughly what needs doing when you buy an old car like this. However, I still think I got lucky in that I now have a solid, reliable car that seems to burn less oil than my spider. It’s been on a few tours and two major road trips – one to Palm Springs and one to Vancouver via Seattle. People say these cars are slow, but my feeling is that compared to its contemporaries it’s reasonably quick, and will cruise well above the limit comfortably (on an offroad course to be sure!). The car is still no thing of beauty, but I like having a car I can park anywhere without worries. Not sure how I feel about the stance. Admittedly, this was with the car packed full, but I think I will lower the front a bit when I rebuild the suspension. Read your site and I like your thoughts. I am in MD now but I saw you know Andrew Waltry. 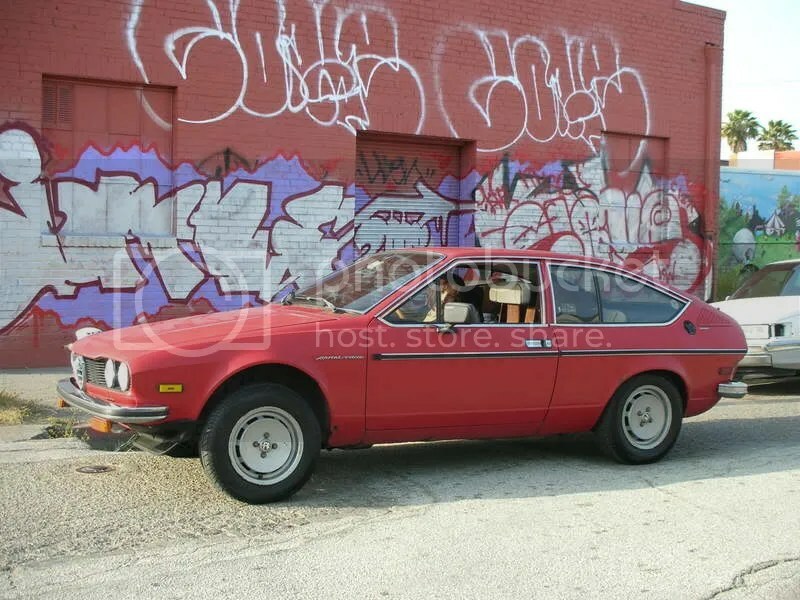 I bought my 79 Alfetta Sedan from him about 11 years ago. Small world. Thanks! Followed your thread on the resurrection of your car on the alfa BB, glad to see it back in action, it’s a really nice example! Thanks for the compliment! I am still learning to turn a wrench but these cars (with all their “personality”) are SO much easier to work on then modern cars. From what I can see in trying to work on my wifes chrysler sebring it was designed to basically weld the hood shut, put in gas, and for anything else take it to the dealer. The thing about alfettas is they are so cheap to aquire that it does not make financial sense to have a mechanic fix anything. Thus, you need to learn to fix it yourself or buy another if anything breaks. Thats my philosophy at least! 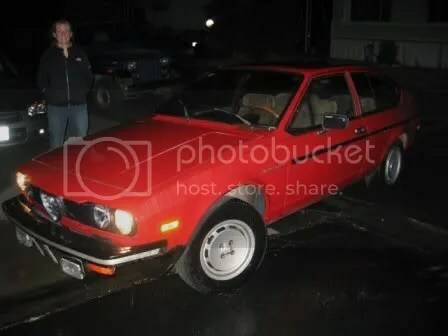 I have a line on 6 alfettas (three coupes, three sedans – two of which (one of each style) are running and licensed and come with some preformance goodies for track use for a grand total of $2000. Still trying to decide where to put 6 extra cars in addition to my alfetta SS and the Milano verde I should have by next week. Oh yeah, not to mention my truck and my wifes POS chrysler – 10 cars for two people is not too many right? Imagine, someone with 8 alfas and not one of which is a spider! That has to be some type of record! Wow Chris, well bought. I thought you spent a bit more. I borrowed your drop light again to help get the steering box out of the TI this evening. Oh, and a chicken from next door got in the shop. Duff and I chased it for half an hour but it’s still in there… somewhere. Yeah, unfortunately it’s distorted my perception of what I should pay for other, similar-quality cars. The Beta is making me realize there was a lot of luck in my Alfetta purchase, even if it did require a fair amount of work since I got it. Hi, I got the same car but silver. I bought it when I was in college new. Obviously I am an old man like 55. I do not used it and it does not start now but need to get it going! call me at 541,301,8028 or email sam@samfungccim.com. Maybe we started a club with people has this car!